I first met Terry Wise several years ago when she contacted me due to a mutual interest, specifically death and grief. I have since had the good fortune to get to know Terry better and to have her speak at two different programs offered by the National Center for Death Education. Terry stands out as an excellent speaker and writer, as well as a committed and compassionate individual. In the aftermath of her difficult years of caregiving during her husband’s illness with ALS and the grief and depression that followed his death, Terry has emerged as one of the rare teachers who combines her personal experience with an understanding of the professional literature in the field. She provides well-integrated material on the experience and treatment of significant loss, grief and depression. She offers workshop participants an intimate look at the ways in which a person’s past history combines with new challenges and losses, the degree to which these stressors can overwhelm a person’s capacity to cope and the sometimes devastating effect this combination can have. Terry is a captivating speaker and clear thinker who talks about difficult material with both sensitivity and humor. 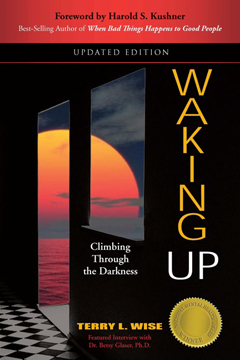 In her book, Waking Up, Terry takes us behind the closed door of her therapist’s office and with a frank honesty shares the experience of her pain, struggles and growth. This book is compelling enough that I was willing to break my cardinal rule of not reading anything work related while on vacation. The choice was well worth it. Her story is captivating as well as educational. Despite my having been a practicing therapist for many years now, the ways in which she shared her conversations with her therapist, her emotional and psychological work as well as her growth stimulated new thinking and ways of understanding the therapeutic process for me. Terry is truly an example of strength and resilience in the face of tremendous adversity. She has a generous spirit that comes across in her personal interactions as well as her teaching. Articulate and compelling, she is a gift to all of us who care for those coping with death and grief. Through her honest sharing of her hard earned wisdom we can all learn to be more understanding, more compassionate and more able to offer what is needed in times of crisis.